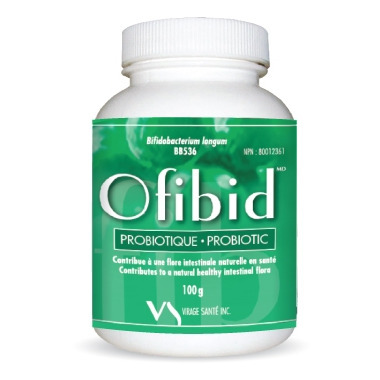 Virage Sante Ofibid Powder contains a stabilized freeze-dried probiotic. It is to be used with antibiotic treatments and improves gastrointestinal comfort. Properties: Highly water-soluble tasteless powder. Strains resistant to stomach acidity and bile. Stable at room temperature for over two years. Dosage (for adults and children 1 year+): Dilute one level teaspoon with a bit of water. Take one to two time daily, as needed or the recommendations of an health care practitioner. Take on an empty stomach. Lactose-free and gluten-free. Suitable for diabetics. I highly recommend this probiotic for anyone suffering with IBS. It has made such a difference pretty much from day one. I take it once a day in the morning before breakfast (it dissolves to a clear, tasteless liquid). I wish I had known about this years ago. To be honest I have been using this product for my dog. My dog's flatulence was making me gasp! So I started using this probiotic on him and presto! his insides calmed down and no more foul odor.